Everyone negotiates in their daily life to reach an understanding, resolve a difference, gain an advantage and ultimately reach a compromise. The same is true in the business of licensing art. When an artist is given a contract by a manufacturer (or agent), it is open to negotiations. Many artists new to licensing think they have to accept the contract as is. 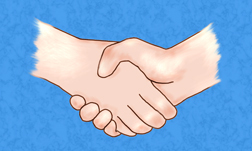 As Dave Ramsey states in his article "4 Things to Remember When Negotiating Contracts," ". . . everything can be negotiated in a contract. If you don't like a certain detail or requirement, ask to have it removed. Likewise, if you want something added, request it. Drive the negotiation so your contract meets your needs." But there are limits to what and how much can be negotiated in the contract so you need to be ready to compromise on what you want or walk away from the deal. For instance, if a manufacturer NEVER gives an advance toward royalties then you will not be able to get an advance no matter how hard you try. But if the advance is not in the initial contract, it is wise to ask for one. You just might get it. On the other hand, if your policy is that you will not sign a contract unless you get an advance, you may not get many licensing deals. Less and less manufacturers are now offering them. Being prepared is important before starting negotiations. You should have a strategy besides knowing the goals of both you and the manufacturer, what contract terms can be traded, and what you are willing to give up or not give up. This makes compromising smoother so that the negotiation is a win-win for both you and manufacturer. Some negotiation terms in the art licensing contract may be: the territory (US, worldwide, Canada, etc. ), royalty rate, product categories, advances, sample approval, number of samples provided, and exclusivity. Negotiations with manufacturers is not normally cut-throat as shown in the ABC TV reality show "The Shark Tank." However, the show demonstrates what happens when an entrepreneur is not prepared when they negotiate with the investors. The entrepreneur will not get the deal if she/he does not know the value of her/his company, know what kind of company the investors are looking for, and have already sold enough products so that the investors will be interested in partnering with them. The same can be true in negotiating an art licensing contract. If the artist is not prepared, she/he may not get the best possible terms. Read the following articles to get information and insights on negotiating tips by experts from various businesses. • "5 Things You Should Never Say While Negotiating" by Mike Hofman of Inc. Thank you for sharing so much helpful information. I had many questions when I first started researching art licensing and then I found your blog--voila! I feel much more confident about taking the plunge.